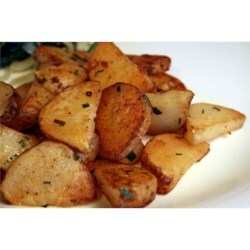 "Home fries with lots of flavor - a big hit every time!" Melt the butter or margarine in a large skillet over medium heat. Add the potatoes and spread out in an even layer. Cover and cook for about 5 minutes. Season with garlic, paprika, salt and pepper; stir to coat potatoes evenly. Cover and cook for another 15 minutes, turning potatoes occasionally. Remove cover, and mix in chives. Increase heat to medium-high and cook for another 10 minutes, stirring frequently, or until potatoes are tender. These were delicious...I added extra garlic and I chopped up a vidalia onion as well that I cooked up with the potatoes, they added a little sweetness. The chives added at the end were yummy!! Fantastic! I swapped out the butter for some EVOO and baked them instead. I also added 3 extra cloves of garlic and 2 tbs. of Essance of Emeril. My kids gobbled them up. These were very good, made them exactly as the recipe said. I will make these often. Very good, and not at all difficult. I will make them with more garlic next time, as the garlic flavour was pretty tiny. If I could rate them 4 1/2, I would. Thanks for a great recipe,Steve.